extreme or irrational fear or dislike of anything new, novel, or unfamiliar. It is sponsored by our modern agricultural industrial complex. In this post, JohnQ posits that the processed food industry uses a common fear in children to condition them into eating highly processed foods and rejecting more nutritious options into adulthood. I noticed this with my children, who when they were living in Japan, ate a surprisingly wide variety of fruits, vegetables and seafood. 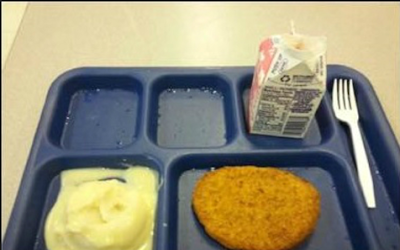 When they started going to American schools and participating in the school lunch program their tastes radically narrowed to just a small spectrum of high sodium, low nutrition, highly processed, bland options. The American public school system often hires large corporations to highly process low grade government surplus food that is then reheated by low wages slaves. Some of the key differences with the Japanese lunch is that it is effectively homemade with a ton of local/fresh/top quality ingredients. It is homemade because mothers from the neighborhood are hired by the school to work with the school children themselves to make it with ingredients purchased from local farms. In Japan, the students themselves are the ones mainly responsible for cooking and cleaning at the schools under supervision of local moms and teachers. 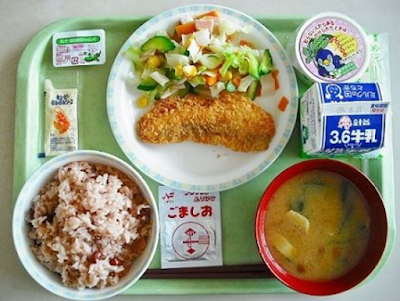 Japan does struggle with childhood and adolescent eating disorders. Schools in Japan give their students the sort of food they’d get at home — not at a stadium, as in the United States. The meals are often made from scratch. They’re balanced but hearty, heavy on rice and vegetables, fish and soups, and they haven’t changed much in four decades. Here’s a look at a day in the lunch-break of third-graders at Tokyo’s Umejima Elementary School. One major truth of modern life is that we live in a hive with an associated hive mind. We are not independent but rely on complex networks to provide us with our needs and luxuries. The collective unconscious mindset operates at a primitive level, one where love, rage and fear dominate. In their quest for power, the elites battle for market share by exploiting this knowledge in order to get us to click the buy button. In this case, they are playing on a primal fear of young children regarding food in order to condition them into favoring unhealthy processed foods into adulthood. Kids are herded into institutional cafeterias and hand them dingy food trays with reheated low grade junk food. Further playing on their fears, students have no hand in preparing the food and the people who do prepare it are often (frankly) creepy. There is some truth to the lunch lady jokes. Neophobia was associated with lower consumption of fruit and vegetables, protein foods and total calories, but there was no association with intake of starch or snack foods. Neophobia is associated with fear of novel foods. Children normally develop this fear starting in their twos, up through their late teenage years. Evolution-wise this is thought to be a beneficial trait as it kept foraging youngsters trying poisonous foods. In modern societies this trait is thought to be maladaptive since people are not out foraging for food in the wild and food bought in the supermarket is generally safe. The American way does not seem to be working very well when it comes to the matter of junk food use by school students. There needs to be an out and out change in the existing condition. The federal government need to formulate new policies to keep junk food away from campuses in the United States.